I recently arrived in Southland, and it feels very much like the end of the earth. It's also not far from Middle Earth, AKA the Queenstown/Wanaka region of New Zealand's South Island (the setting for Sir Peter Jackson's epic Lord of the Rings triology, which was shot "just up the road", in Australian terms at least). It seems fitting that since I am writing about crowd funding, on the eve of the New Zealand launch of Jackson's latest instalment The Hobbit on 11 December, that this post should at least mention the indiegogo.com campaign for the Lord of the Rings (LOTR) Project. But first, I want to look at two other indiegogo crowd funding campaigns that IMHO are much more important. The first is a campaign for a documentary titled 2 Degrees, which tackles the very pressing issue of climate justice, a term used to explain a range of ethical concerns in the climate change arena (you can find a good definition of it at http://globaljusticeecology.org). The documentary explores two epic struggles in the battle against climate change - Tolkien-like tales about the imminent peril facing our world if we choose to ignore the science and instead continue to trash our forests (the lungs of the earth) and rely on dirty old fuel instead of renewables. The film's title refers to the generally accepted premise that if we can constrain the global temperature rise to less than two degrees Celsius then we won’t get into what is termed a “dangerous climate change” scenario. The rise is already 0.8 degrees. 2 Degrees examines the UN climate change negotiation process along with a grass-roots campaign in the South Australian town of Port Augusta to replace dirty coal-fired power stations with a new technology called solar thermal. Shot over two years in Australia and 15 other countries, the film goes behind the scenes at the very highest levels of the United Nations Climate Change negotiations in the struggle to make rainforest preservation part of the accord. The film documents the negotiations imploding at Copenhagen and the inability of world leaders to reach agreement, despite recognising the urgency of the problem. Producer Jeff Canin fears that COP18, the current climate change conference in Doha, will again fail to make the legally binding cuts to greenhouse emissions that will start to make a difference in the fight. The documentary will make the point that if the top down solutions aren’t achieving the necessary goals, then it’s up to the general public to demand the solutions. “The current round of UN climate change negotiations in Doha brings back mixed emotions for us. Those meetings are painfully slow moving and the evaporation of trust among poor countries towards rich countries at Copenhagen was heart breaking. I want to convey to our audience that governments are stalling and we really need a revolution around this. Part of that revolution is crowd funding things that matter and can help make a difference,” Jeff says. He believes that the growing popularity of crowd funding signifies the rising tide of people power. Jeff's production company, Green Turtle Films, aims to raise $200,000 using the indiegogo crowd funding platform. You can find out more, and join the revolution, here or like it on Facebook here. Like Jeff, Producer Sandra Cook has also had to look at more innovative ways of reaching audiences with her documentary The Ride. The documentary, which is about four men ditch who their wheelchairs for a quad bike adventure and visit their crash sites along the way, is already in the can but Sandra is also using indiegogo to raise money to take the film on a national tour. With only eight days left, Sandra has already raised 54% of her $40,000 target. (above) The Ride's producers Sandra Cook and Jim Cairns, also one of the stars of the show. To support the crowd funding campaign, Sandra and her team have envisaged a really clever social media campaign that includes photographing audience members at preview screenings, holding up white boards that summarise what The Ride has inspired them to do, and then posting these on Facebook. You can donate to Sandra's crowd funding campaign here or find out more about The Ride's social media campaign on Facebook here. LOTR Project is a website that a chemical engineering student called Emil Johansson started in January 2012 with the purpose of visualising the vast world of Middle Earth. With its increasing popularity the website uses a high amount of bandwidth and so Emil launched a crowd funding campaign on indiegogo to upgrade to a more expensive hosting solution. He has already reached his very modest target of $600, but says he will use the additional money raised (and it's still coming in) towards the development of an iPhone app. When my 12-year-old friend Maya sent me an email with a link to Kony 2012 (a simple but impersonal 'check out this video on YouTube' and URL) on 12 March, I thought her laptop had succumbed to a virus. But Maya was standing up to be counted, just like hundreds of thousands of other children and young people. In a blog post titled ‘9 marketing lessons from Kony 2012’, Sean X Cummings observes that one of the most telling statistics from the YouTube data in the first days of the Kony 2012 campaign was that the video was most influential with girls and boys aged 13-17. ‘This was a bottom up campaign that started with children, to influence the “culturemakers”, to influence their parents, to influence politicians,’ writes Cummings, summarising this phenomenon as a ‘demographic influencer cascade’. Social justice campaigners in Australia are now attempting to take advantage of the spotlight shining on child soldiers. A new experiment in online broadcast media, 3Q – Questions That Count, this week features an interview with Tim O’Connor from UNICEF Australia, during which he warns that Kony 2012 must yield results or risk disillusioning Gen Y. Like me, O’Connor first heard about the Kony video from his 13-year-old nephew. 3Q – Questions That Count is a weekly show broadcast at www.essentialvision.com.au that is the brainchild of Essential Media Communications. The media agency says it’s a new way of telling stories, and presenting opinion poll results, using self-produced broadcast-quality video. Former Triple J reporter Sarah Macdonald hosts the panel-based talk show. Every week, she poses three questions to three guests and then opens up the discussion to the panel. As well as the panel show, Essential Vision also provides a link to ‘five lessons aid agencies can take from Kony 2012 to promote their own cause’. Interestingly, the original title for this list (a blog post by Maja Rode) was ‘five lessons brands can learn from Kony 2012’. There's no doubt there’s something in this for everyone. The first Australian screening dates have been announced for The Burning Season and we've launched a companion site at www.tenthingsyoucando.com, which has been designed to give audiences who see the documentary some practical suggestions about how they can bring about positive change. The philosophy of this web site is based on the belief that the future does not have to be scary - sustainability and abundance are possible. As one of the proud supporters of the site (and the person who produced it with the help of designer Nathan Betts and web developer Yari McGauley) I sincerely hope it helps us work together to create a future based on renewable energies and operating systems that value and respect the natural world. Even though I am travelling at the moment and away from my daily news routine, I haven't been able to escape the mainstream media images of the Wall Street stock market meltdown. Let's hope that the Phoenix that emerges from the ashes is one majestic bird. In the meantime, my friend and fellow journalist Kaye Blum has forwarded me an email from her friend Paul, an expat Australian now living in Spain. Paul and his friend Ricky Maard have just launched a web site called Global Votes (globalvotes.net), where they say "anyone with an internet connection can vote in surveys and polls with worldwide implications". On the home page, Global Votes claims to be a "a prototype for a new system of world government of the people, by the people, for the people; a survey method in which all citizens of Earth can express their hopes and requests and have them heard." At the moment Global Votes features only one issue for voting, the 2008 US election. Paul says in his email: "I have long felt that the choice of the so-called 'leader of the free world' is too important a choice to be left solely to citizens of the United States. After all, look what a bad choice they've made the last couple of times! So if you feel the same as me, here is your chance to have your say. Even though our vote won't count of course for the official election, if we can get enough people around the world to express their opinion, we hope that the result may have an influence on the voting choices of some Americans." Given the turmoil in the US financial market in recent days, I can also suggest one more topic for Global Votes: Is capitalism dead? "The statistics are now up to date and you can view the statistics page without having to vote. Unfortunately the survey program we are using at the moment does not not update the stats in real time, they are updated on a daily basis. We plan to remedy this in the near future. Is Capitalism Dead is a good suggestion for the next vote - we are working on it..."
You can find out more from Tara Darlington on 0405 456 617. A few months ago my good friend, business colleague and mad keen surfer Russell Green from RUCC Pty Ltd told me about Visual Petition, and asked me for my support. Visual Petition is a global petition for the conservation of marine animals, backed by Byron local and soul surfer Dave Rastovich and numerous other surfing luminaries. Jack Johnson, Kelly Slater, Andy Irons, Wolfmother, Missy Higgins, Xavier Rudd, Mick Fanning, Ben Harper, Taj Burrow and many more have added their names to the growing petition. But they also gave it a face, many faces. 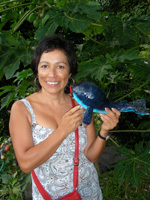 Only a few nights after I joined the petition - and gave it a very unfamous face - another good friend of mine, the fabulous Fabiola, offered to make a paper mache whale for me to take to Melbourne, where I was attending a 40th birthday party - the ideal setting to collect more pictures/signatures. Fabi the whale was born. Surfers for Cetaceans, the group behind the Visual Petition, will be attending the International Whaling Commission (IWC) meeting in Chile in June 2008, where it will be printing out all of the visual petitions onto three huge banners, to be presented to the IWC delegates and the international media in protest of the dolphin and whale killing. Fabi the whale has since been embraced by almost 100 people and pictures of her now form part of the 'petition wall', which will become the banners presented at the IWC meeting. You can see part of the petition wall, starring Fabi the whale of course, by clicking on the link below.